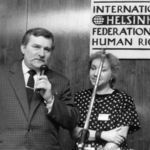 Founded in Bellaggio, Italy in early September 1982, IHF was mandated to monitor and promote the complete fulfillment of the human rights provisions of the Helsinki Final Act and its Follow-up documents in the thirty-three countries which had signed the Act on August 1, 1975. IHF channeled the efforts of already existing Helsinki monitors and other human rights advocates and interest groups to exercise pressure on non-complying governments by conducting investigations and field missions in those countries, and issuing regular inquiries, press statements and open letters. Although the KGB managed to force the closure of the Moscow Helsinki Group in the same year that IHF was formed, with the advancement of the Helsinki Process, more and more countries established their National Helsinki Committees or monitor groups, for which IHF secured formal representation, support and common strategy. As a result, in 2007, the year of its closure, IHF was able to supervise and influence human rights developments in Organization for Security and Cooperation in Europe (OSCE) participating states through its 46 independent member organizations. As official caretaker of the Federation’s historical records, OSA preserved and maintained IHF’s archive since the late 1990s. Following an initial shipment in 1998, documents came to Budapest in several installments, parts of which were gradually processed and their finding aid published. The current finding aid unifies and brings up to date all previous versions, and thus opens up for research the complete (55 linear meters) textual, photographic and electronic records of IHF from 1982 to 2007. Materials in this archive include correspondence, interoffice memos, mission files, media monitoring, newsletters, reports and photographs. They are arranged in several series by themes and document types, such as country files, correspondence and memoranda, project files and publications. Digital copies of some of the IHF documents have been already published via the Parallel Archive under various different projects. In 1998, OSA organized an exhibition on the history of IHF, which then traveled extensively to major cities including New York, Amsterdam and Moscow.